Growing celery can be frustrating until you give in to its persnickety ways. Like a spoiled princess, celery demands a rich environment (very fertile soil), distance from the riff-raff (weeds), her drink kept topped off (always moist soil), a comfortable climate (55-75°F), shading from hot sun (row cover in mid-summer) and care to keep her skin pale (stalks blanched). If you deprive her of these things she will become tough and bitter as she ages. If you think of celery as a northern European marsh plant (the native habitat of the original wild celery) you will get an idea of how to provide celery with the right conditions. The original celery ancestor was called “smallage”, and it was much stronger-flavored than our celery, being used more as an herb for seasoning than as a vegetable. Celery is very slow to germinate (2-3 weeks), and is also very slow growing until it reaches its stride at about midlife. At midlife, if the temperature is right, it will take off. Because it is such a slow starter, if you live where there are noticeable winters, start growing celery seeds indoors in late winter or early spring, in seed flats under bright lights. My true confession is: I'm not actually growing celery in my hot, dry Colorado garden, because I find it too much work to create conditions that are to its liking here. 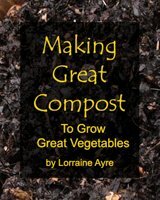 But if I did grow it, I would plant the seeds on the surface of the soil and then cover them with a light sprinkling of soil. The seeds must never be allowed to dry out, and this is one case where having one of those self-watering mat trays underneath the seed flat might be good insurance against forgetting-to-water. The three types (and their specific varieties) show minor variations in preferred conditions, so follow your seed packet instructions. In order to ensure that the celery stalks do not get too tough, stringy or bitter, they should be blanched about a week to ten days before you plan to harvest them. This actually decreases the nutritional content because the chlorophyll and other plant pigments will be reabsorbed, but it makes for more tender and better tasting celery. One good way of blanching celery is to cut the bottom and top off a milk carton, squeeze the stalks together and gently slide the milk carton over the lot. The celery leaf tops should stick out of the top - if they don’t, trim the carton down so that they do. Another way to blanch celery is to use fall leaves or straw as a mulch, and mound it up around the stalks to block the light. One way of harvesting celery is to just take one stalk at a time at any stage of growth, whenever a stalk is large enough to be useful. 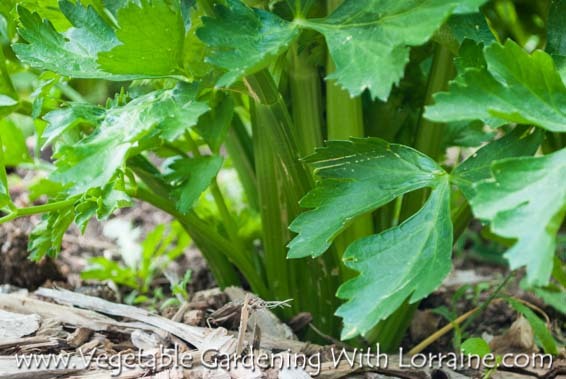 You can also harvest the whole plant while young about an inch above ground, and new celery stalks will grow from the root. But the most common way of harvesting celery is to wait until it is full grown, blanch it (as above) for a week to ten days, and then harvest the whole thing by cutting it off about an inch or two above soil level. If there is enough time left before frost, the plant will then regrow again from the root. Celery is a biennial plant, meaning that its natural life span is two years. It makes its green growth the first year, and then sends up a flower stalk and makes prolific seeds in its second year, before it dies. All parts of the celery plant are edible - stalks, leaves, root and seeds, with the latter having a particularly strong celery flavor that is delicious in soups and stews.